When talking to a prospective student about signing up for an art class, Ric wore the impish look of a benevolent saboteur. It said, "Forget your neat little go-about-your-business life! Forget your excuses! Get on board!" For me, succumbing to the call of the River Gallery School meant exciting, frustrating, joyous creative hours spent in studio space overlooking the Connecticut River, in meadows, by streams, on farms amid tractors and plows, painting, painting. I have to admit I was one of Ric's more stubborn students. After all, I'd been to art school -- graduated, even. Nobody could tell me much of anything. I'd been attending summer landscape classes a couple of years before I even tried Winsor & Newton brown-pink! But I enjoyed the gentle tug-of-war that was our student-teacher relationship. We developed a mutual respect, as he approved of what I accomplished artistically, and I became immensely moved by Ric's devotion and passion for art and for teaching, his outside-the-box artwork, and his brave struggle with illness. 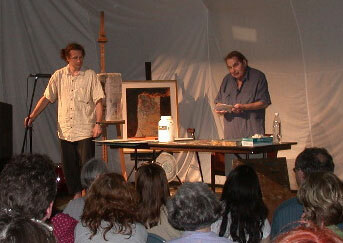 generations of students at River Gallery School. Ric believed down to his core that art is a spiritual path -- you use it to get to someplace in yourself, that opens you in a way nothing else does. That was the place where Ric built his house -- staked his ground. And that house he built was solid as the weather-beaten stone houses in his "Monolage" series, grounded solidly as the encaustic paintings he built up on paper, the pigment like earth itself. The Monolage series, and a wonderful small collection of works have been at the River Gallery School since the beginning of August. The paintings are like a voyage to the bowels of planet Earth, brushwork like a shovel digging to reach the heart, the guts, of existence. The larger paintings in the main gallery especially, have a self-contained, profound presence. In 2003 I interviewed Ric for a piece on Andy Warhol that I was writing for the Reformer. I figured Warhol, with all his spin and hype, would come in for a rough ride under Ric's no-nonsense gaze. Instead Ric was actually quite generous in his assessment. He gave Warhol credit for the strength of his images, for conceptual innovations, though he did not consider him much of a painter (he said look to Jasper Johns for that). But the point is, he took the time and effort to really think about Warhol, his place in history, what Pop meant and means. It was so clear how much he cared. Also during that interview, Ric opined on his philosophy of art, the importance of living with art -- not as something rarefied, apart . . . but art as an essential part of the very fabric of existence. That was its true place. He spoke about how important it was to get art into people's hands, and educate the public to not be intimidated by "Art." We discussed how to make that happen locally. Ric's solution was to practically give his art away. I viewed this as rash, as he clearly was in need of financial bolstering. But Ric had a hard time worrying much about his own situation. Fortunately, he engendered as much love and devotion as he gave, so many people were there to help him. 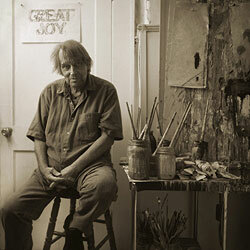 Before I left his studio, he insisted on my taking a couple of the "Great Joy" paintings, knowing that my partner Marty was ill. They were hung by Marty's bed all during the last months. And after -- a reminder of what many spiritual practices and religions hold to be our birthright, our natural state, when we have let go of everything but the present moment. How excellent that Ric was able to leave being aware that a one-person show in his honor was being hung at the River Gallery School, the school he co-founded. He even picked out which pieces would go into it. The hope, his hope, was that the show, expanded to three rooms instead of one as his passing became imminent, would help his family with medical bills incurred over the past years. Happily, many works have indeed sold. New ones will take their place as the show, in a more limited version, goes into a second month. Ric's death has been a wake-up call for me, for sure. We were to have a talk about the most recent medical trials and tribulations he had endured. I got the feeling he wanted to share some insights, perhaps spiritual in nature. For some reason I kept putting it off, one of those "non-essential" things in life -- an intimate conversation -- that in reality is what friendship, and life, is all about. When I cried at the news of Ric's passing, it was as much for myself as for him and his family. I'd held out that conversation to myself as something special that "I would get to" when the daily grind kind of stuff was done. It never is. Seize the moment! Ric knew this better than anyone.